This recipe is simple, quick, tasty, healthy and is a great way to make use of the abundance of zucchinis readily available in the summer months. Gently saute the red onion and garlic in olive oil in a large saucepan until soft and translucent (not brown). Add the chopped zucchini and hot stock and simmer on medium heat until the zucchini is tender and cooked through. Add the mint and parsley, season with salt and pepper and remove from heat. 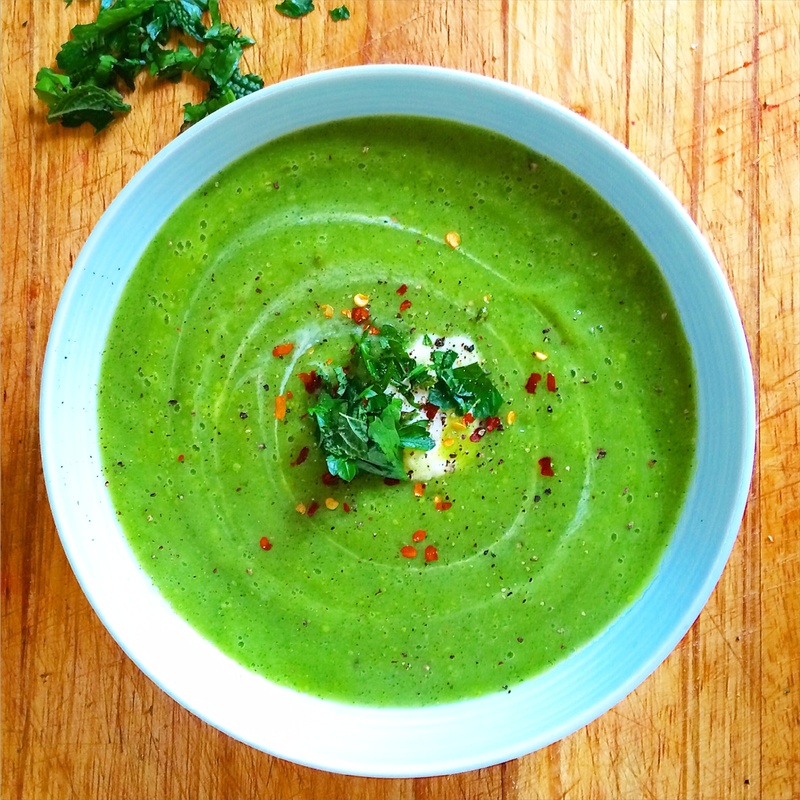 Blend in batches in a heat proof blender until the soup is silky smooth. Once all of the soup is blended, return to heat for a few minutes prior to serving. Top with chilli flakes, extra mint and natural yoghurt (optional) and serve. Enjoy! ELE tip- if your blender cannot handle hot liquids, wait until the soup has cooled before blending, then return to the heat to warm through prior to serving. Soup can also be served chilled in hot summer months, if preferred. Looks so delicious! <3 Thanks for sharing the recipe! so perfect, we still have zucchini coming out of our ears in our garden! This is lowkey the prettiest freaking soup I’ve ever seen, how do you even eat that? the colour of that soup is fantastic! Yum! We still have many many months until we have fresh zucchini but this will definitely be our or list to try, thanks! It will be a few more months before we have the zucchini to make this, but I’m looking forward to it! This looks GORGEOUS! What a photo! Wow. that color is amazing! Gorgeous recipe, I look forward to trying it!